Indestructible Ukrainian hard rock hurricane inevitably hit Minsk city. Fans of the immortal heavy metal finally had the opportunity to enjoy its power and greatness. Wave from the south brought not only technical and quality performance, but also a true spiritual, nostalgic show, and reminded the sound of the best teams who were pioneers of heavy scene. They have greatly contributed to its development, left an indelible mark in the history of rock music. Friends you have probably guessed that I mean a great long-awaited festival Monsters Of Rock cover fest, which was held on Friday, December 12 and was dedicated to the iconic eponymous festival which thundered in the stadium Tushino in Moscow in 1991. Legendary band AC/DC, Metallica, Pantera and other grandees of the world stage visit the post-Soviet space for the first time within this largest festival in the history of heavy music. “It was generally the biggest concert by live attendance. From the start the crowd was a bit shy, but then “blew up” … For those people, rock music was a symbol of victory “- says Brian Johnson. In 2012, in Kiev brought together the best and for that moment probably the only bands of tribute-movement in Ukraine, who have decided to re-create the most fantastic festival. First participants of cover performances were AS/DS, Scream Inc. and Blood Brothers. Right after the last song ended it became clear that it makes sense to hold this festival every year. The lineup changed a bit today: there were only AS/DS and Blood Brothers, and honor to play Metallica went to the band from great city of Dnepropetrovsk – MetalForce, which lit Ukrainian scene with immortal heavy hits since 1993. Finally, talented performers moved to the Belarus to fulfill the hearts of new fans with favorite metal hits and remind this audience about quality of undying music. December 12 in Minsk club “Center” also held a grand remake of the legendary festival. 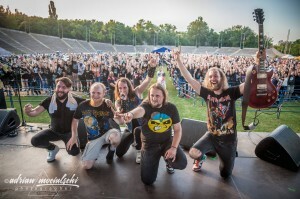 Monsters Of Rock tribute fest, which has already beloved by Ukrainian audience also gave an incredible splash of drive and fervor from the Belarusian public. Within around four hours of live sound we heard Australian rockers AC/DC played by AS/DS, the best thrashers in history – Metallica interpreted by MetalForce, and Blood Brothers – who played a number of Iron Maiden hits. Performance of in Minsk was dedicated to the 30th anniversary release of the fifth studio album Iron Maiden – «Powerslave». It took place within “Slavery Tour 2014”, which was announced at the beginning of the year in Ukraine and neighboring countries. It is not surprising that the concert began with a siren title theme of the anniversary album – «Aces High». Eponymous song «Powerslave» was played right after it, and another smash hit from the album – “2 Minutes To Midnight» sounded at the end. Performance of the third longest Iron Maiden song – «When The Wild Wind Blows» was a real surprise. Song lyrics reveals terrible reality of beginning and consequences of nuclear war. And of course they could not forget about the legendary hits of all time – «The Trooper», «Fear Of The Dark» and song that give the name to prominent Ukrainian tribute «Blood Brothers». Singer Yegor was using a number of conceptual tricks during performance. Once he was in front of an audience in fancy vest with the flag of Confederacy. Then appeared in the embroidery with a flag of Ukraine, and at the end of the show in role of the monster Eddie, who dies in convulsions. In few words, Yegor is very artistic, outstanding and extraordinary frontman. Indeed, group justifies the lack of desire to copy the outer style of Iron Maiden with such an interesting show, and yet it makes the performance of Blood Brothers solid and memorable. I was filled by the feeling that the audience is really made a journey through time and are on the same Monsters Of Rock! It was such an incredible likeness in the sound to the original, and support of fans was so warm and sincere. Many thanks to the organizers of the event, to cheerful audience of that night and certainly, talented bands AS / DS, Blood Brothers and MetalForce, who gave the fans of classic heavy scene opportunity to feel the sound of the legendary rock and metal bands. It is a pity that I did not find analogues of such high-quality tribute bands on the Belarusian stage. However, it is good that the spirit of unity is alive, and among the inhabitants of our southern neighbors there are talented guys who to managed to reproduce this majestic music and brought it as well in our lands. So – Viva Ukraine, and let heavy metal reach each and every Belarusian home!